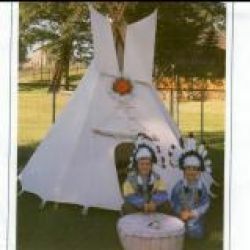 The children tipi is suitable for Indian festivities or Birthday parties. It is also a great attraction for kindergarten events or wedding parties. 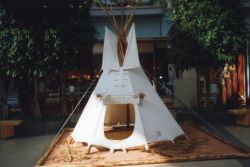 The children tipi is a round tent, which is sewed after the original Sioux style of the real tipi. There are two smoke flaps, a lacing pin strip and a round doorway, which can be closed with a door flap. The tipi tent is made of 100 % cotton, which is impregnated against water and rottenness. The skeletal structure, which is made of wood of spruces, is bound as a 'Four Pole Base system'. It means that 4 poles are fixed together so that you can directly build the children tipi up. The tent is regularly receivable in the sizes 2,20 m/ 7.22ft., 2,60 m/ 8.53ft. and 3,00 m/ 9.84ft.